Fighting fury with F.I.R.E. - Professional Association Management Company | Virtual Inc. The “bad” Board member. Every Board has one. Just say their name and people roll their eyes. This person exists on nearly every Board, but takes on different forms. Sometimes it’s a person who is intentionally disrupting the group’s activity. Sometimes it’s a person who monopolizes discussion. Sometimes it’s a person who is abusive to his peers and staff. So how do you deal with this person? Find out what’s driving their behavior. Big Bird once told me that asking questions is a great way to find out things. He’s right—if you can find out what’s driving them, you can often change their behavior. Isolate their impact. You can do this a few ways. One critical way is to maintain your communication with other board members. Make sure that one “bad apple” doesn’t promulgate misinformation that poisons the opinions of others. Another strategy to isolate the impact of a troublesome board member is to be mindful in your facilitation of meetings. Think about when you call on this person, or where you place their “hot button” items on the agenda. Removal. Most bylaws have provisions to remove Board members for cause or lack of attendance. Don’t be afraid to exercise these options. Evaluate your rules and procedures. Is someone troublesome because they miss meetings then disrupt votes? Be sure you have good standing requirements in your policies. Is someone disrespecting staff? Be sure to have a code of conduct. Remember, you can’t enforce rules you don’t have. 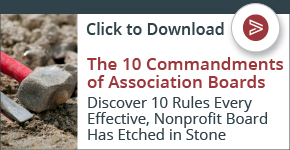 An association management company with Board support services can help your Board to function at its optimum performance level and reduce the potential harm of a negative member.